Where do we begin? If you’re reading this blog, you’re either into digital marketing or you’re an attorney. Or you just like reading informative content. Either way, there’s a quite a lot to go through revolving around marketing your legal practice. 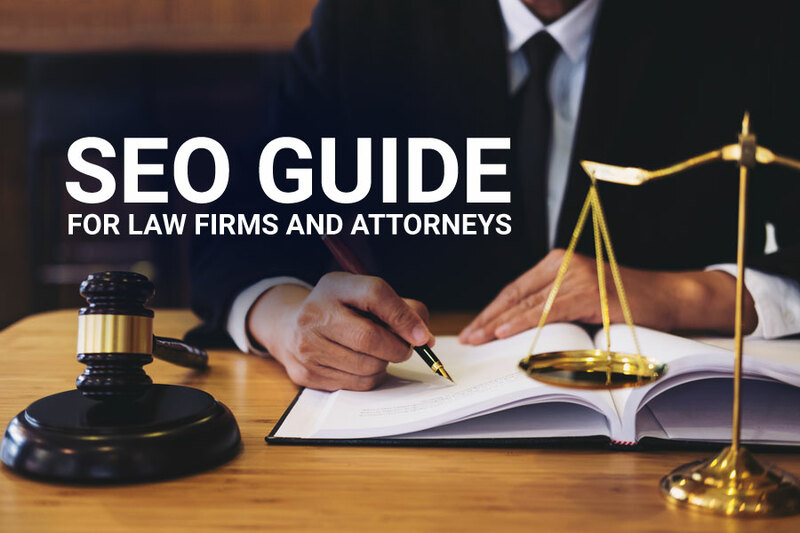 This article is going to cater towards law firm SEO and some best practices that will help your law firm rise in the search rankings. This will be mentioned often throughout the article, but it’s important to keep in mind that search engine optimization takes awhile to see results. It’s a long-term investment on your behalf. You know when you click a link that’s got all sorts of question marks, dollar signs, and a bunch of mumbo jumbo? Yeah, it’s awful to read those types of links. 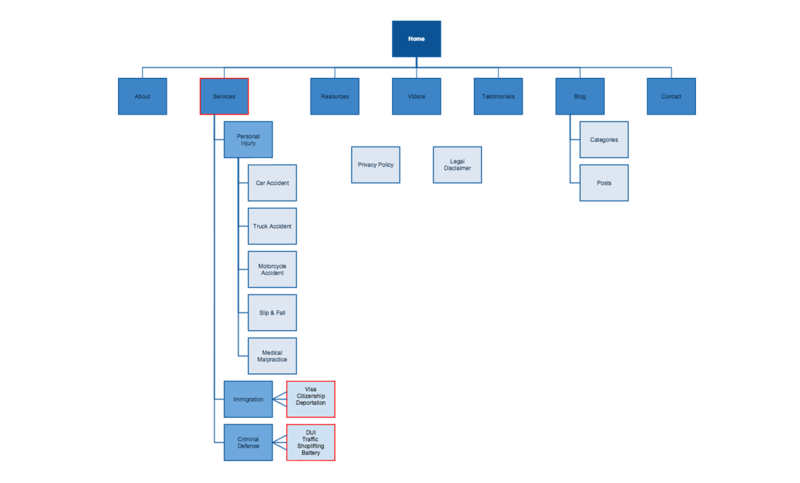 It’s much easier to read a clean link that shows a proper breakdown of your website. See how that’s a nice clean link to read? It’s got a clean breakdown of which part of the site you’ve entered. Just as it’s easy for us to read, it’s easy for the search engine crawlers to read when they’re deciding on how to rank a web page. It’s important to have a clean breakdown of your website. You want to funnel specific pages into specific areas of your site. Ease of use for your website is integral for your user. First you’ll need to ask yourself: What kind of law firm do I have? Do you provide multiple services, or just one specific service? From this answer, you can create your website domain specific to what you do (if you just offer one service), or perhaps just your firm’s name (if you offer a variety of services). You get the point. It’s a neat, clean breakdown of your site that will funnels users into the specific areas that they’re looking for. It’s important to create pages for each of your services in order to get ranked in search engines for those services. It’s also important to create unique content for each page so you’re not getting docked for duplicate content. It’s extremely important that each of your web pages have different content, and that you haven’t copied that content from any other website. Uniquely-written content for each and every page is critical. It’s also important to keep your duplicate content ratio below 10%. One way of checking for duplicate content on your website is using Copyscape. For this section, we’re going to assume your law firm already has an existing brand and website. If your web presence and website is starting from scratch, some of this won’t apply to you until much later down the road. The first thing that you need to do is make sure you’ve claimed your business on Google Places (you’ll want to do this when you’re starting from scratch as well). If you haven’t claimed your business, you need to. Once you enter in your information, Google will send you a postcard with a verification code on it. This process will take 2 – 3 weeks. Once you’ve gotten your postcard, Google will recognize your firm as an actual business, which will begin building immediate trust. It will also help in local SEO and get you advertising in prime Google locations to reach new customers while funneling back to your website with a link. You’re going to want to go into your Google business page and make all the necessary edits needed. It’s also important to use the correct keywords in your business description to relate to your business. Google has created a tool which essentially audits your website to make sure all the pages your website claims to have are actually there. If a page claims to be there and it isn’t, Google will basically flag it and notify you. At this point you’ll need to investigate why pages may not be there, and apply any fixes. Search Console, formerly known as “webmaster tools”, will also audit the credibility of the websites that are linking to your pages and provide you with reports. When you move your business from one address to another, you’re going to forward your mail to the new address. This is essentially what a 301 redirect does. This is vital to keep your website’s domain authority and not lose it. Still reading? Thanks for making it this far. I know it’s a lot to process, but this is the stuff that helps the long-term success of your law firm. Remember, law firm SEO is a long-term investment with a lot of legwork at the beginning. Fresh new content is vital to improving law firm SEO. You’re going to need to create content for your website through blogs and articles. And if you’re thinking, Why does my website need a blog? We’re a law firm, check out why it’s important to have a blog for your website. The better your content, the better the chance of it being linked by others, being shared on social media, and driving traffic to your website. All of this is taken into consideration by Google when they’re ranking your pages. This is one of the reasons why it’s important that the topic of what you’re writing about is actually what you’re writing about. Have you ever searched for something, found an article that seemed to be what you were looking for, then clicked on it…only to realize that page has nothing to do with what you searched? You immediately click away, right? You click a link that you believe can provide you with the information you’re looking for. You quickly scroll and scan the page, looking for keywords and headers with the answers you want. You realize that the page is completely irrelevant. You click out of the page. Google keeps track of that. It’s called your “bounce rate”. This is taken into consideration when Google is ranking your pages. 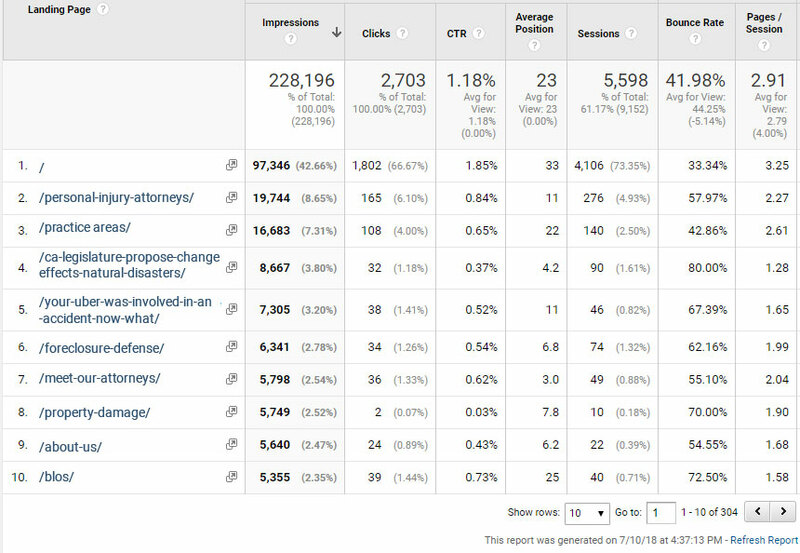 Having a high bounce rate penalizes you in your law firm SEO. That’s why it’s important to have quality content that’s actually about what your title says it is. What Type Of Content Should I Write? That’s up to you. You’re the expert at your practice. However, there are some central guidelines that help the likelihood of your content to be shared and linked. Offer guides on specific topics relating to your law firm. Give in-depth detail on how things work when someone breaks the law. Use visuals when at all possible. This helps to break up the text. Give detailed information on the rights that citizens have. Average Session Duration: the average amount of time someone spends on your website in a single sitting. Bounce Rate: the percentage of single-page sessions in which there was no interactions with the page. Number Of Sessions Per User: The number of times a specific user comes back to your website or page. Pages Per Session: The average number of pages viewed in a session (this is where good content will push users to visit different pages on your site). What does all of this mean? It’s an indicator of the type of content your website produces, as well as how well optimized your site is for user use. Google takes all of these factors (and many more) and applies it to how they rank your website pages. The more marks you hit properly, the higher your page should be ranked. But again, this is all a long-term investment. Results take a while to see. But once you can see them, they stick around for a long time! This type of good content will only help your law firm in the long run. One of the main goals is to present yourself as an authority. When users continuously see your pages ranked highly, it drops a little note in their mind that says, Hey, these guys know what they’re talking about! It’s important to link to various pages on your website. Google recognizes these links, and once the web crawlers scan it and realize it’s good content or actually related to what is being linked, it will build towards your overall law firm SEO. In the above example, we had a blog about Google’s changes to local SEO. That was linked to our search engine optimization page. The Google algorithm can read what we’re linking and where it’s being linked to, and will then judge whether it’s the correct content or not. 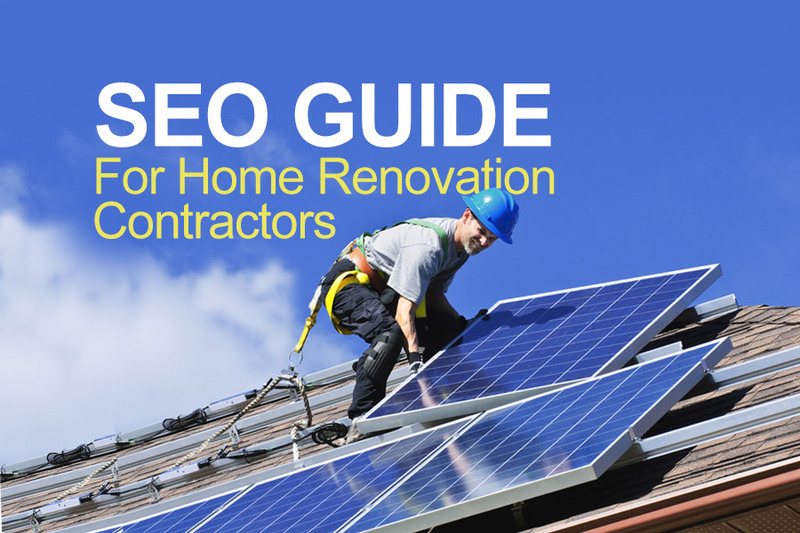 Over time, this helps with your law firm SEO. Once you build up a library of content, you can link to various articles within each other. Just make sure that when you’re linking something, it actually is about what you’re linking to. Naturally, some pages on your website are going to generate more traffic than others. It’s just how it is. You can use Google Analytics to find that information to help make a bigger impact on those landing pages. As you can see above, Google Analytics lists the top landing pages on one of our websites (and you can add variables to this to filter out specific information that you want). From here, we can understand what pages are getting the most views and then optimize those pages for our business. When you create great content, you improve the chance of having others link to your website. We discussed this briefly earlier, but it deserves its own section. When websites with high domain authority link to pages on your site, this helps to improve your law firm SEO over time. One thing that’s important to note is that while you want as many backlinks as possible, you don’t want your website to get linked by websites with poor domain authority. Websites that have a reputation (from Google) to be filled with spam linking to you can penalize your SEO over time. It’s more important to score quality backlinks from reputable websites than it is to get quantity. What Types Of Backlinks Are Important? There was a time when you could simply pay other websites to link to your law firm’s site. It didn’t matter what the site was, just that your pages were getting links. Today, that’s a no-no. Google’s algorithm can recognize when a plumber’s website is linking to a law firm. It understands that one really has nothing to do with the other. In the short term you might improve your search results, but over time Google’s algorithm will pick up that this linking has nothing to do with each other, and it will hurt your SEO and credibility. One of the easier ways to build links to your website is to list your business in relevant directories. Listing your business in a number of websites will not only help build links, but it will make your business more visible to those that are using those directories. A lot of businesses don’t even think to do this, so you can get a step up on your competition this way. Make sure it’s relevant to your field. Make sure you’re able to leave your website link. The above three directories are free. There are others as well that you have to pay for. It’s 2018, and that means it’s imperative that your practice has some form of social media presence. Having a positive digital presence will not only help to market your firm as an authority, but it will help your law firm SEO. The content that you create on your website (blogs, videos, podcasts, etc.) can be shared by you through your social media. If it’s good content, people will share it—especially if it’s informative. The more it’s shared, the more traffic you will receive which can indicate to Google you’re doing something right, thus improving your SEO. Just make sure that you’re aware of what you can and can’t post on social media. Hopefully you’ve made it to the end. There’s a lot to process for SEO. It’s a never-ending job to continuously have your law firm ranked highly. The good thing is that as long as you regularly create good content and run the audits and analytics on your site, you’ll maintain a good ranking. Just as with other technology, Google’s search algorithm is constantly changing. It can be difficult to both run your firm and keep up on the changes. You can always partner with a digital marketing company to run everything on the back end, but knowing the above information is always helpful to you. Essentially Google—and any search engine—has a set of rules that say if you want your pages to be ranked and indexed here, you must hit all of these marks. Digital marketing professionals know what these important markers are, however, Google is constantly making changes so that users always receive the best search results for their searches. Because of this, it’s smart to keep your ear to the ground for what’s new and shifting in the search engines. Over time, the goal of SEO is to drive qualified traffic to your firm’s webpage. The more traffic you gain, the higher the likelihood that qualified traffic turns into leads for your firm. Say it with me one more time: law firm SEO is a long-term investment for your company. Keep that in mind when you’re making changes and awaiting the results!